In the tradition of “The X-Files” and “Indiana Jones,” the new SyFy Channel series “Warehouse 13” merges the detective genre with ancient paranormal artifacts. After saving the president’s life from an assassin controlled by an Aztec blood stone at the Capitol Museum of Natural History, Secret Service agents Myka Bering (Joanne Kelly) and Peter Lattimer (Eddie McClintock) are transferred to a secret government facility in the Badlands of South Dakota. 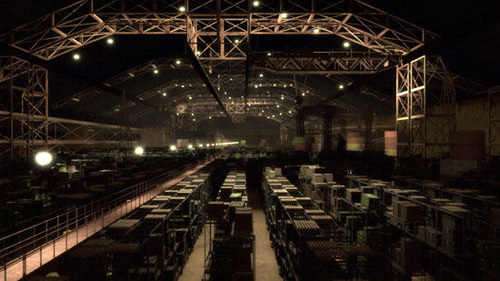 Identified as K39ZZZ on the North American grid, the facility known as Warehouse 13 is overseen by an agent named Mrs. Frederic (C. C. H. Pounder, “The Shield,” “Millennium”) and its caretaker is Arthur “Artie” Nielsen (Saul Rubinek, “Nero Wolfe”), who has spent many years researching and hunting for dangerous artifacts that threaten national security. Despite agents Peter Lattimer and Myka Bering being initially reluctant to embrace their new assignment, they soon realize that their respective skills make them well suited for the task. Bering is a by-the-book agent with an eye for detail, while Lattimer complements her strengths with his enthusiasm and gut instincts. Watch “Warehouse 13” on DVD or Blu-ray disc, or with Amazon Video On Demand. 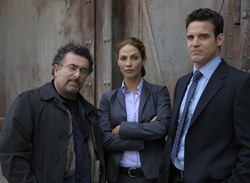 For more information, see the official “Warehouse 13” Web site at SyFy.com.